The Houston Association of Realtors has officially launched voice commands in its free HAR.com mobile listing app. Dubbed “Car Mode,” the new feature aims to allow agents and consumers to “instantly access property sale and rental listing information on their smartphone, safely and hands-free,” the 37,000-member trade group said in a press release. Here’s how it works: The consumer or agent enables Car Mode, and when they are stopped in front of a property for at least three or four seconds, the app identifies the nearest listing and and begins reading details about the property such as list price, square footage and number of bedrooms and bathrooms. Voice commands don’t work while the car is moving and the delay is intentional, so that the feature won’t turn on if someone is at a stop sign, HAR Chief Technology Officer Taqi Rizvi told Inman in a phone interview. Car Mode allows consumers and agents to access information without having to take out their phone, scroll, zoom in or otherwise search for information — even if it may take an agent longer to hear the information than read it, according to Rizvi. “While the information is being read to them, the basic information is on the screen as well,” he said. If there are multiple units nearby or across from one another, the app will ask which property the user is interested in before reciting details, he added. 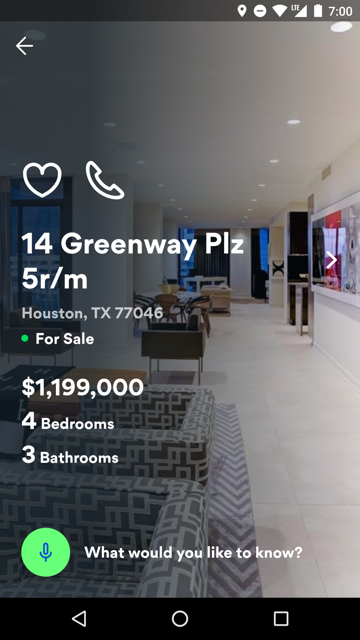 Users can ask the app for more details by speaking commands like: “Financial information,” “Showing information,” “‘Tell me the assigned schools for this property” or “Call the listing agent.” HAR MLS subscribers can ask for Realtor-only information such as sold prices and private agent remarks, the association said. “We approach design and search with the user in mind for the best experience looking for a home,” he said in a statement. HAR did a soft launch of Car Mode a couple of months ago, but did not begin promoting the app to its members until this week. HAR.com debuted in early 2015 and displays the vast majority of Texas real estate listings. The mobile app is available for Apple and Android devices. “HAR is committed to making the homebuying process as easy and accessible as possible,” HAR Chair Kenya Burrell-VanWormer said in a statement.